While I was finishing our homemade light bright tabletop, inspiration struck. I thought, wow, wouldn't it be cool to use the light bright table as a geoboard? So of course, we had to try out my idea and boy, oh boy, was it fun! Sensory play and fine motor work all rolled into one! 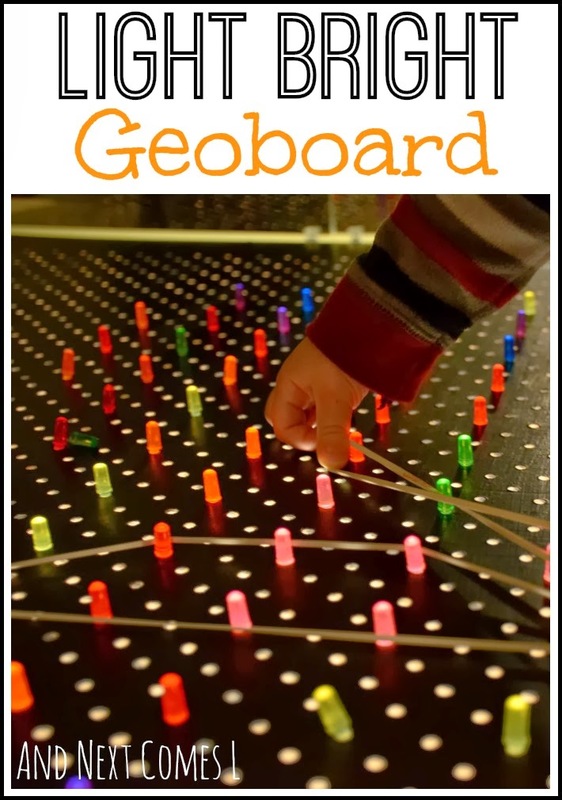 This light bright geoboard is a certainly a unique fine motor activity for kids, one that your kids will request to try over and over again. To make the geoboard, I formed a grid using light bright pegs. I simply put a light bright peg in every other hole. As you can see, the geoboard ended up being pretty large as our light bright tabletop is pretty huge. However, you could try setting up a geoboard on a flatscreen lite brite to achieve the same effect. Here's the number one that J and I made together. And here's a close up to show you how awesome this light bright geoboard is. Yup, you totally want to make one now too, don't you? I laid out some rubber bands and let the boys play. And as you can see, the boys worked their fine motor skills by stretching the rubber bands around the light bright pegs. And they pulled the rubber bands for more fine motor practice. Don't you love the focus of K here? He was totally into this activity! And then the boys twisted the rubber bands to make new shapes and designs. I could literally play on our homemade light bright tabletop all day. It's so cool! I think I love it more than the boys do. Be sure to check out these wonderful posts from my Fine Motor Fridays friends. This looks like fun! I wonder if there are neon rubber bands you could find?? That would be awesome! It would be fun with neon bands! I just used what I had on hand though. I totally DO want to make one now - and I want to play with one too! lol! Aw, reminds me of the old school lite brite I grew up with! So fun! See and I always wanted one growing up and never did get one! Awesome! Wonderful! I love it.